Science Metrics released a study in Oct. 2014 which measured the proportion of open access papers published in peer-reviewed journals at the European and world levels between 1996 and 2013. This study represents the largest scale measurement of open access availability performed to date. The source for data collection was the Scopus database, which is the largest abstract and citation database of peer-reviewed literature with presently 55 million records, 21,915 titles and 5,000 publishers indexed. Below is a redacted version of the report’s executive summary; the full report can be accessed here. The Science Metrics study report assesses the free availability of scholarly publications during the 1996 to 2013 period. A sample of one-quarter of a million records was used to study the historical evolution of open access (OA) between 1996 and 2013 and a larger, one million records sample was used to perform an in-depth assessment of the proportion and scientific impact of OA between 2008 and 2013 in different types of OA, for different scientific fields of knowledge, and for 44 countries, the EU28, ERA, and the world. As of April 2014, more than 50% of the scientific papers published in 2007, 2008, 2009, 2010, 2011, and 2012 can be downloaded for free on the Internet. This is an important finding as only two years ago, in April 2013, the proportion of papers that was freely available was just a hair below 50% (49.54%) in 2011 and did not reach that mark for any other year. On average, the citation advantage of OA papers is 40.3% while the citation disadvantage is 27% for non-OA papers (based on a total sample size of 209,000 papers). The growth of OA appears as the result of four main forces: (1) historical growth in the interest in OA, which translates into new papers being increasingly available for free; (2) the growing interest in OA also translates into actors increasingly making old papers available for free; (3) OA policies that allow for delaying OA to scientific papers with embargo periods produce a concomitant disembargoing of scientific articles, which creates additional growth in old papers being made available for free; and (4) the number of published scientific papers is growing, so even for a stable proportion of OA, the number of OA papers would keep growing. Other forms of OA—Gold OA Papers (that is, those with article processing charges published in subscription journals or so-called hybrid journals), Green DOA and Gold DOA (embargoed self-archiving and embargoed journals), ROA (Robin Hood or Rogue OA) and papers archived in non-institutional repositories such as ResearchGate—account for a large part of the pie. This large, heterogeneous set contributes the largest proportion of OA papers, and there is therefore an urgent need to disaggregate this category. More research and more careful classification and thus finer-grained measures are required to better understand how these various categories contribute to OA growth, what their pattern of time-delay is, what their transiency is (especially of the ROA), how important backfilling is and how far back it goes. OA=90%), Biomedical Research (71%), Mathematics & Statistics (68%), and Biology (66%). & Textual Studies (31%), Historical Studies (34%), Engineering (35%), and Philosophy & Theology (35%). Gold OA availability is greatest in general S&T (58% of the sampled papers) and lowest in general arts, humanities & social sciences (2.6%); it is also very low in the visual & performing arts (2.8%), built environment & design (3.5%) and engineering (4.1%). Other fields with high availability in Gold journals include biology (17%), agriculture, fisheries & forestry (16%), and public health & health services (16%). proportion is low have a sizeable citation advantage, such as the visual & performing arts (80% more cited), communication & textual studies (66%), philosophy & textual studies (63%), historical studies (55%), general arts, humanities and social sciences (51%), and engineering (38%). An explanation to this is likely to be that papers from researchers in these fields are more likely to have their papers used as there are fewer OA papers available. Citation statistics on Gold journals require careful interpretation. First, many Gold journals are younger and smaller, and these factors have an adverse effect on the citation rate and hence on measured citation scores. Authors frequently prefer reading and citing established journals, and it is therefore a challenge to start a journal from scratch, and to have authors submit high-quality articles. It takes time to build a reputation and to attract established authors. published in the 2008–2013 period and available for free download as of April 2014. Within the European Union, Green OA is more widely used in Portugal (16.3%), Ireland (15.8%), France (14.0%), and Belgium (13.8%), and least used in Lithuania (4.5%), Malta (5.0%), Croatia (5.2%), and Romania (5.3%). The countries that least use Gold OA journals are France (6.6%), the United Kingdom (7.2%), and Belgium (7.4%). Green OA is free, and the majority of publishers accept that papers can be self-archived in one form or another (pre-print, post-print with final revision, or PDF) with no delay. Moreover, two-thirds of Gold OA journals do not levy author processing charges (Suber, 2013). There are free avenues to OA and cost should not be construed as a barrier. 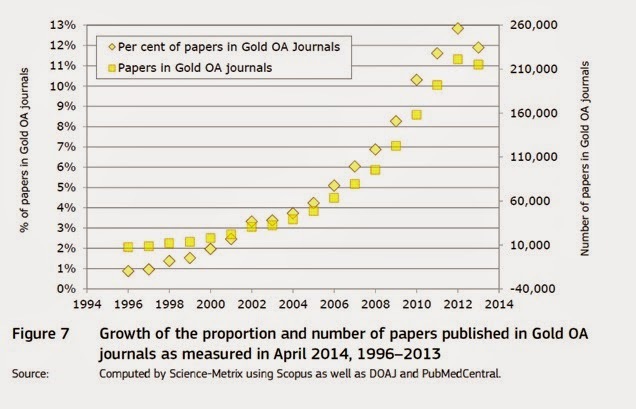 1996 was only 0.9%, but grew to 12.8% for 2012, the annual growth rate being 18% for this period, which means that the proportion of articles in Gold OA journals doubles every 4.1 years (see Figure 7 below). Scopus covers less than half of the quantity of journals listed in the DOAJ, so this figure likely underestimates the true extent of the role played by Gold OA journals. For a discussion around the rationale on diamond open access (DOA) publishing, see Fuchs, C. & Sandoval, M. (2013). The diamond model of open access publishing: Why policy makers, scholars, universities, libraries, labour unions and the publishing world need to take non-commercial, non-profit open access serious. TripleC: Communication, Capitalism & Critique, 11(2), pp. 428-443. Suber, P. (2013). Open access: six myths to put to rest. The Guardian. 21 October 2013.